A perfect rain- a little over an inch! A great way to start the week. Another powerhouse week in the garden. The theme for the week was weeding and more weeding and then weed some more. We stuck with it every day and it looks great! 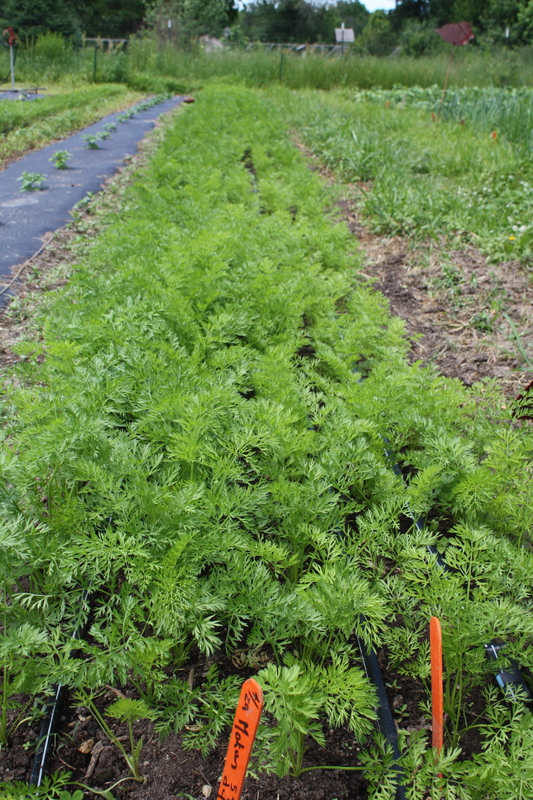 It’s cool to have long long rows of carrots but daunting to have long long rows of carrots that need fussy weeding and thinning. But, I stuck with it for hours and am happy to say we have 10 70 foot rows of weed free carrots that look perfect. 1 of the weed free carrot beds. Another day was spent going through the summer onion bed and it too is weed free and looking strong. 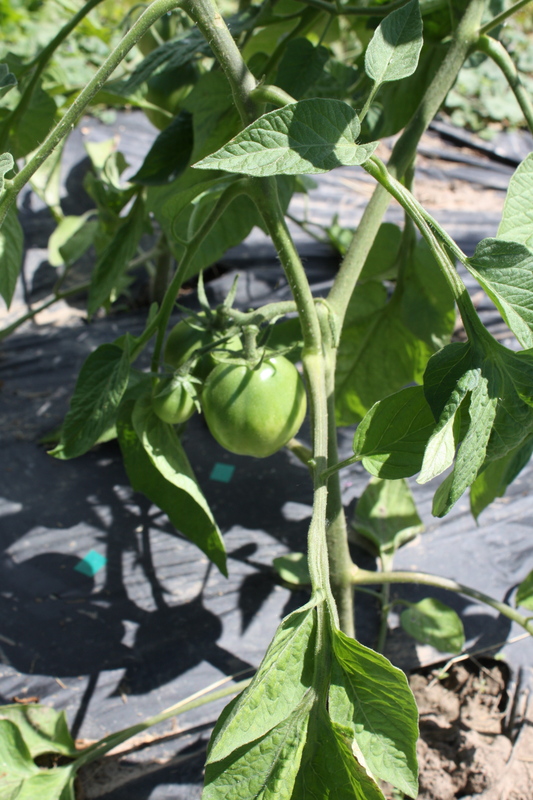 We increased our plantings this year with hopes of a bounty crop later in the season. All fussy work and oh so slow but worth it. When we were not weeding our days away we were prepping another carrot/beet bed to plant this week for a late season harvest. Maeve “watering in” the new carrot bed with a squirt gun. 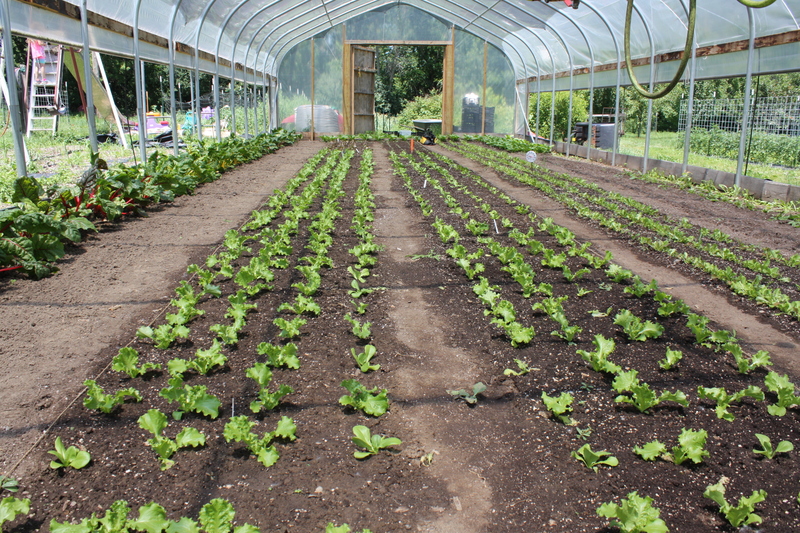 The hoop house is just about transformed to summer lettuce now that the last Asian greens were harvested. Several rotations of lettuce planted and 2 more going in this week. Transplanted lettuce that went in where we harvested the last of the Asian Greens. Other fun news around the garden. 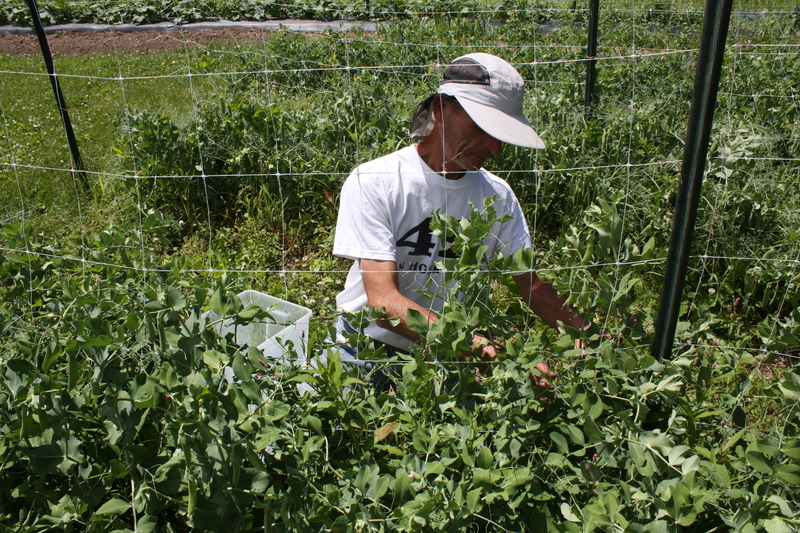 We are seeing the shift to summer crops and soon to follow harvest. 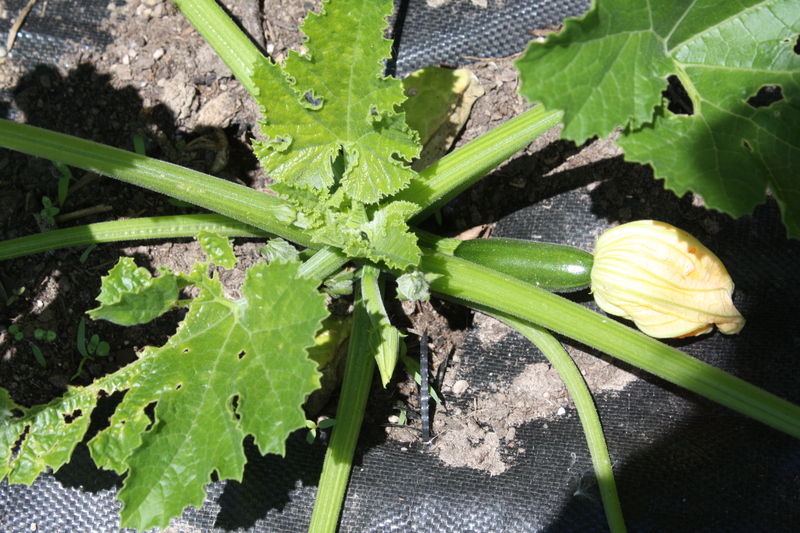 The cucumbers and peppers are flowering and setting fruit and I bet we will pick our first zucchini this week! 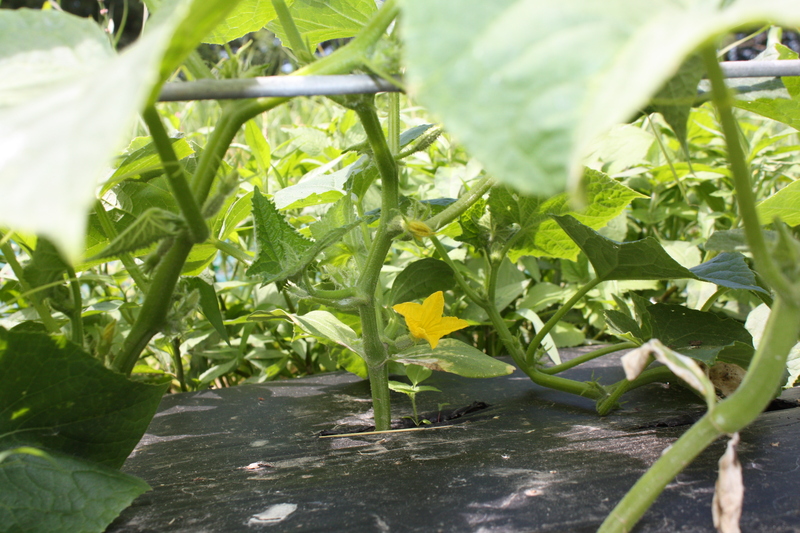 Cucumber plants are climbing up the trellis and flowering. AND! take a look at this….. The greenhouse is filling up again with flats seeded in for late season plantings….I mentioned to Scott when I finished the seeding that I felt like I started a whole new garden again. 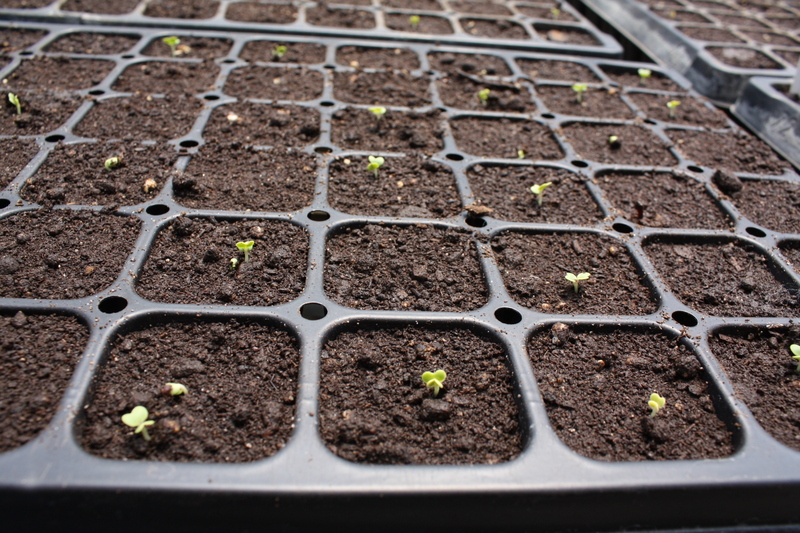 Broccoli, cauliflower, cabbage, herbs, leafy greens, and more are all germinated and ready for Fall eating. A summer pac choi that we will harvest in 45 days, Crazy that we will be eating this in early August! Look what else is happening in the berry patch…. 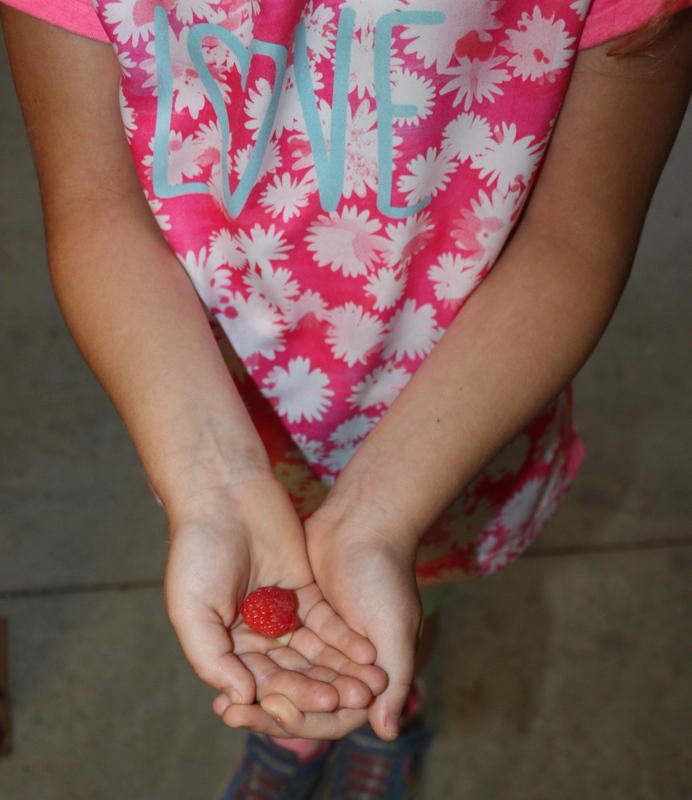 1st raspberry! The patch is finally established and the plants are loaded. A great share this week AGAIN! 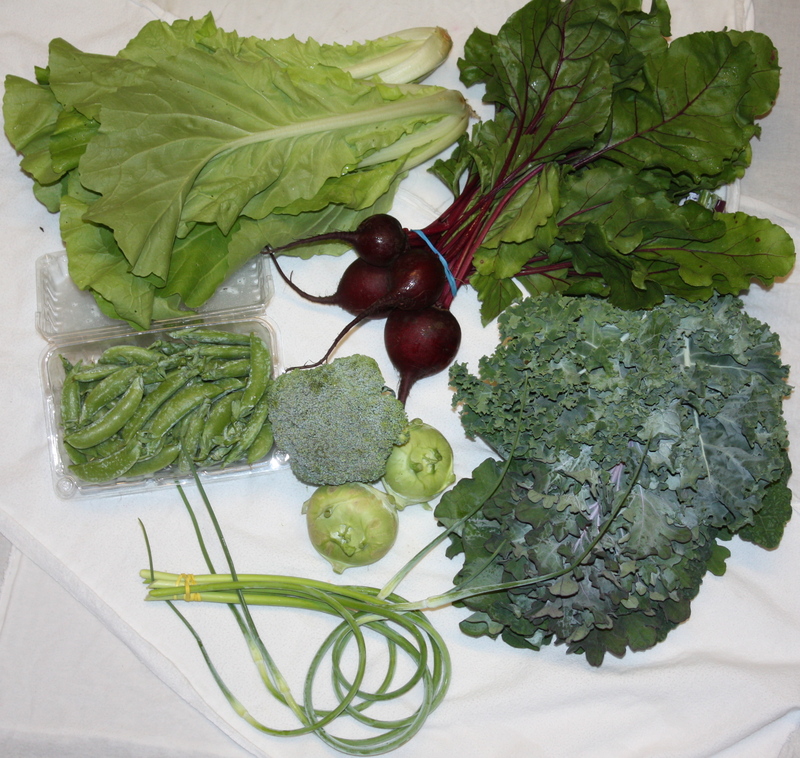 Enjoy…..248 pounds of delicious garden produce! 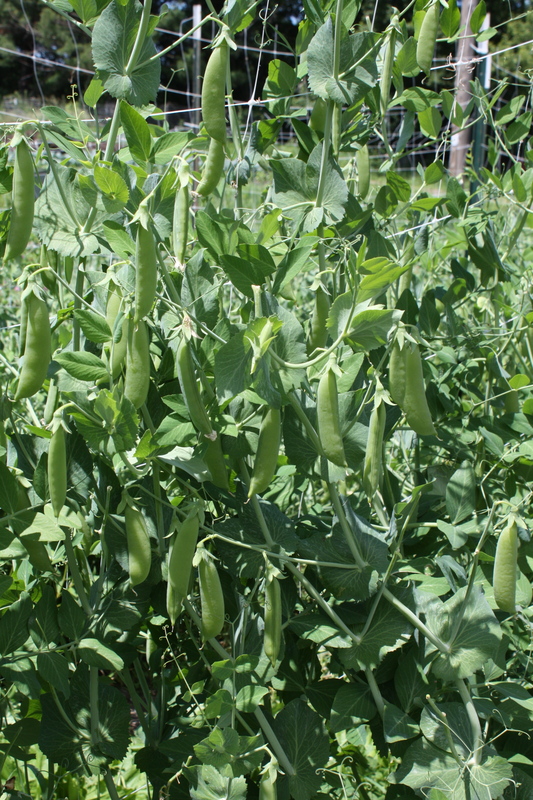 Sugar Snap Pea Bonanza!-A fantastic harvest of this favorite crop. 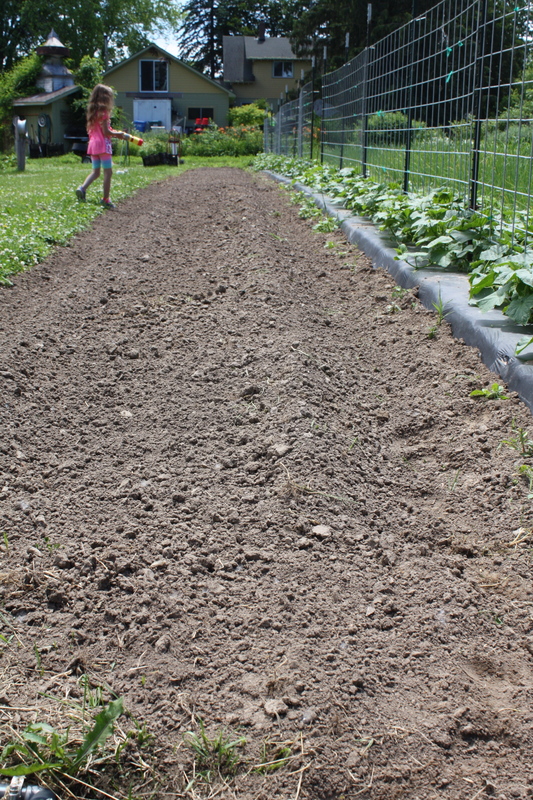 We planted long rows of 2 varieties. Sweet and delicious. 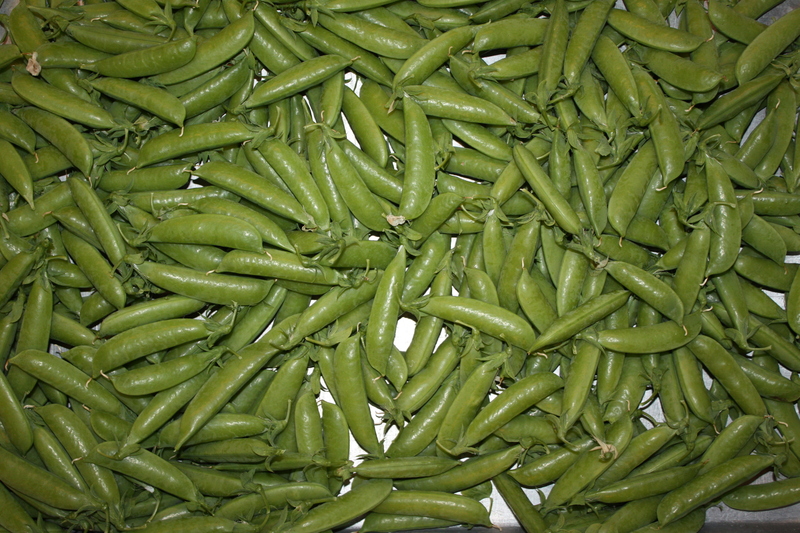 Sugar snaps chilled and ready to be portioned for the shares. Sugar snap on the vine…. Scott picking the shorter variety of sugar snap. Kale-A favorite in our house. A big assorted bunch. We planted many varieties this year. Try baked Kale Crisps in the oven. Maeve eats big bowls and thinks they are better than potato chips. Also, a fresh salad of Kale is delicious. Remove the center rib, tear apart the leaves, rub with olive oil and let sit a bit. Then create a delicious salad with your favorite additions. Also, a kale bean soup is tasty. 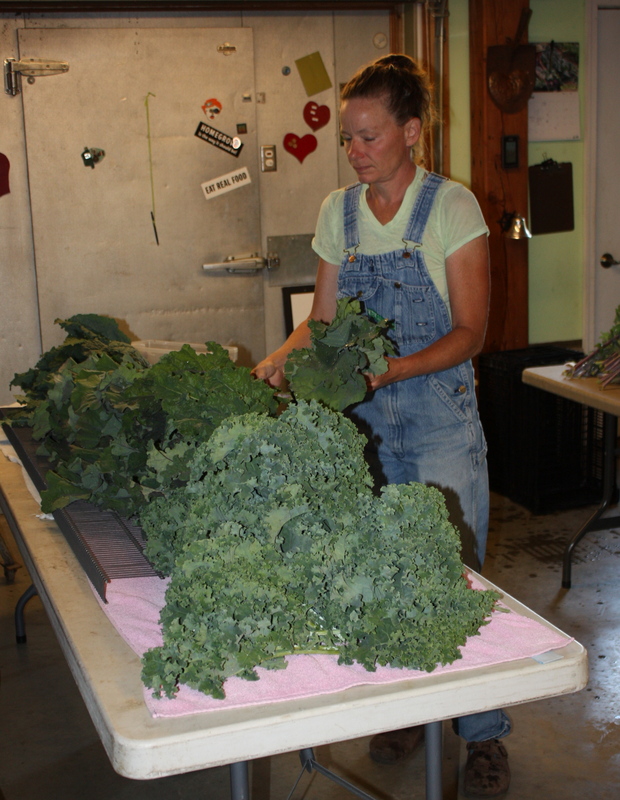 Washed Kale ready to be bundled. Kohlrabi-2 in every share of this snappy treat. Peel and eat fresh. Asian Green- This pretty, bright lime green variety is called Tokyo Bekana. It has light ruffled leaves and tastes a bit like a fluffy chinese cabbage. Add to a mixed salad to add “loft” or all on its own. Garlic Scapes-Another round of these tasty treats. We love to saute in olive oil and use as we would garlic. Long storage life in the crisper drawer in a sealed plastic bag. Arugula- A snappy bag of this peppery green. A mildly spicy green that is a nice addition to a fresh salad or fantastic as a pizza topping. 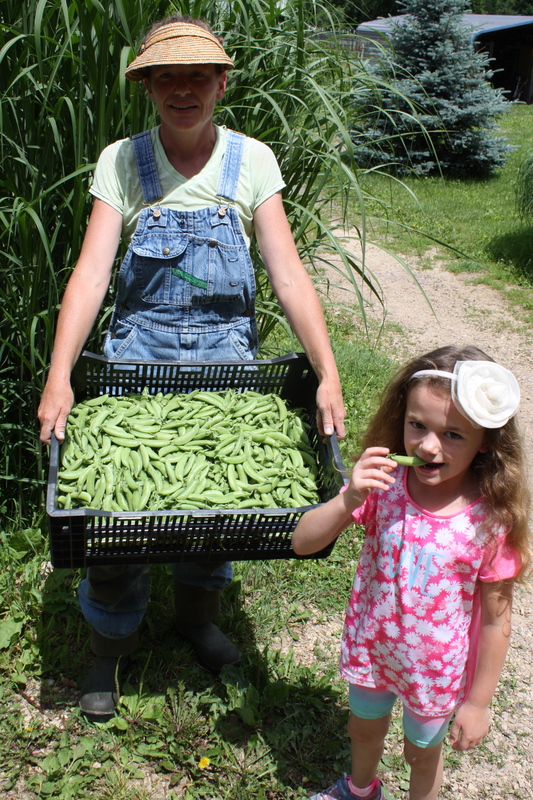 Harvest from 1/2 row sugar snap…..I know “nice visor” Pretty…..I’m trying this year to keep the sun off my face. Portioning the Peas for this weeks share. 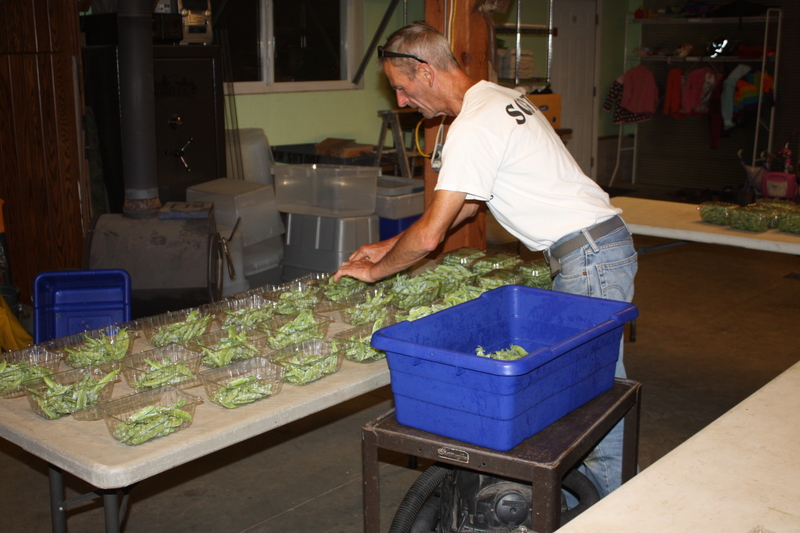 Hey, look out the window- it’s dark out….we don’t go to bed until everything is portioned and ready for share packing in the morning. It’s 10:00! Kale-A favorite in our house. A big assorted bunch. We planted 7 varieties this year. Try baked Kale Crisps in the oven. Maeve eats big bowls and thinks they are better than potato chips. Also, a fresh salad of Kale is delicious. Remove the center rib, tear apart the leaves, rub with olive oil and let sit a bit. Then create a delicious salad with your favorite additions. Also, a kale bean soup is tasty. 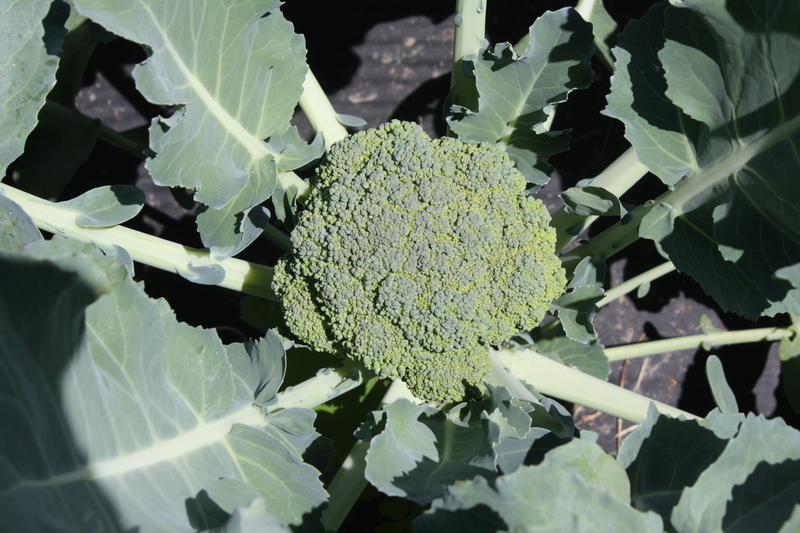 Broccoli-Well, this is a surprise….I was harvesting the kohlrabi and looked over and a few earlbird broccoli plants decided to head up. Enjoy this first little taste of more to come. 3 varieties are planted in the field now and 4 more to go in yet. Beets-A sweet bundle of these pretty gems from the hoop house. 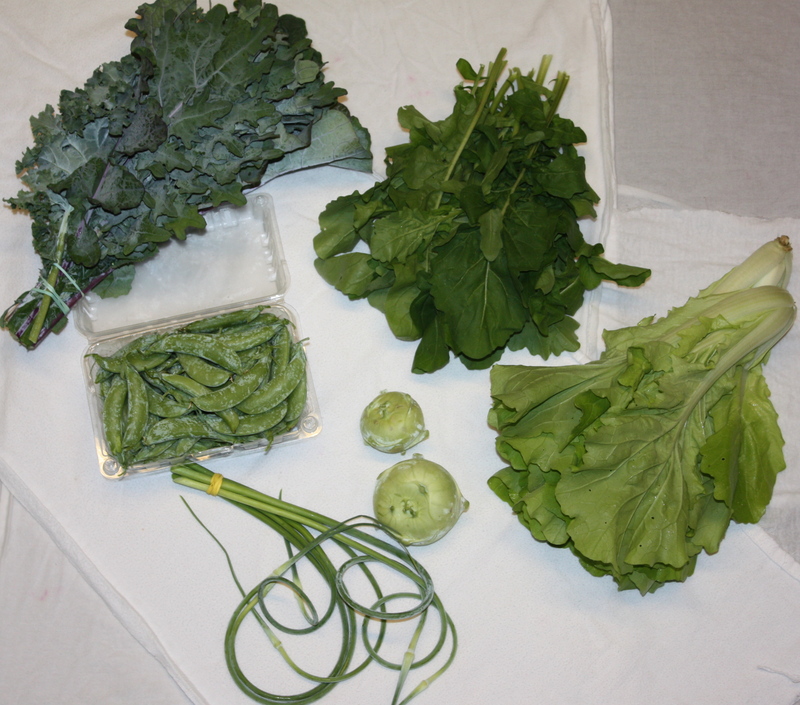 BEST GUESS FOR NEXT WEEK-lettuce, chinese cabbage, sugar snap peas, shelling peas, and more…..
Belated Happy Father’s Day to all the Dads in the CSA. Hope you had a wonderful day yesterday with your children. Maeve and Scott. We take a picture in this spot on Father’s day every year. 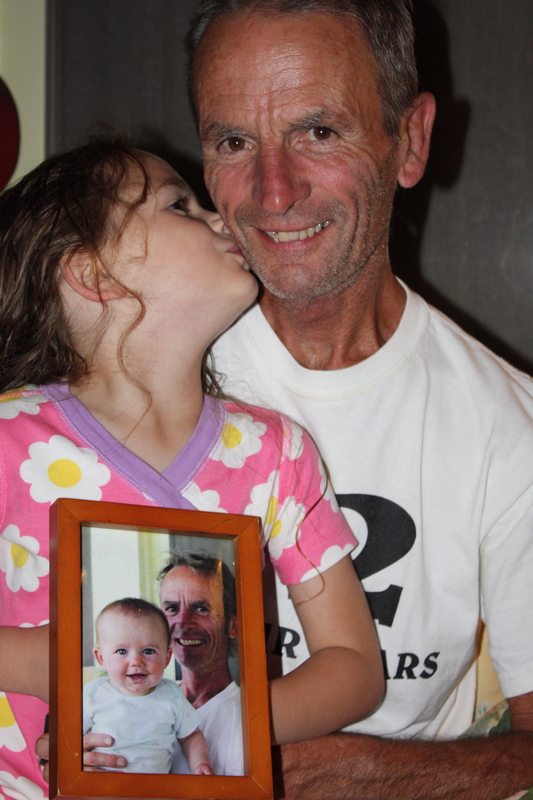 LOVE the picture of Maeve and Scott and baby Maeve and Scott!